Could a widely loved populist make a comeback? Lula is like a man on fire. The former president, now age 72, does not seem to sleep. Since last August, Lula and his Workers’ Party (PT) have been traveling around Brazil with a “Lula for Brazil” Caravan. This bus caravan has gone to every state in this vast country, with Lula giving impassioned speeches in defense not only of democracy but of the gains made during the PT’s time in office. Hunger, for instance, declined dramatically as a result of Lula’s policies. In 2014, Brazil was removed from the UN hunger map. The government of the ‘soft coup’ that took power in 2016 has attempted to reverse the social democratic policies of the PT. Hunger has risen again. It is likely that Brazil will reappear in the next UN hunger map. It is not easy to dismiss Lula. The PT has declared that Lula will be its presidential candidate for the elections of October 2018. Every single poll shows that Lula would trounce his opposition. The polls from Datafolha and MDA show Lula with twice the support of his closest challenger, the right-wing congressman Jair Bolsonaro. Even right-wing commentators are uneasy: it would be almost impossible to defeat Lula in a free election now and perhaps even in October. If the right-wing cannot defeat Lula at the polls, it has now sought two alternative strategies. First, to disqualify Lula from running as the PT’s candidate. Second, to use force to intimidate Lula and his supporters from campaigning vigorously. In 2010, as part of their campaign against corruption, Lula’s government passed a Clean Record Law (Lei da Ficha Limpa) to prohibit money laundering by politicians. Globally, the insertion of money into politics has corrupted democracy. There is no question that the rich have been able to drive their own political agenda because they can buy political power. It is difficult for parties of the working class, the peasantry and the precarious workers to operate in elections. They are disadvantaged by a lack of money. In 2014, Brazilian authorities—under the command of Judge Sergio Moro—opened an investigation known as Operation Car Wash (Lava Jato). This investigation was to find out if there was corruption in the state-run oil company Petrobras and whether bribes had been paid by construction companies to politicians. In March 2016, the Brazilian Supreme Court allowed the investigation to go after Lula. Lula denied all wrong-doing and his lawyers accused the judge of bias against him. Lula was said to have received renovations for an apartment which had not yet been built when he left office. The judge—Moro—released taped conversations he had with Lula’s successor Dilma Rousseff. Impartiality had clearly been set aside. Public harassment—including a raid on Lula’s house—has been intended to malign his character. Attempts to arrest Lula have failed. Sections of the judiciary are embarrassed by this political attack on him. Politicians of the right openly call for Lula’s disqualification from the presidential run based on Operation Car Wash.
None of this appeals to ordinary people. They see Lula as their hero and as a man being persecuted for his political views. They see the oligarchy as being united in preventing Lula from standing for the presidency. This, to them, is a political witch hunt. Lula’s Caravan began in the Northeast of Brazil, the home to the poorest people. It is where Lula was born. Huge crowds gathered to greet him. It sent a message to Brazil’s oligarchy that Lula was emerging as the candidate of the people. It is the reason why the PT backed Lula fully and—despite the judicial challenges before him—have kept their faith in his candidacy. Lula has come to symbolize the aspirations of ordinary Brazilians. That is what the crowds demonstrated. Lula has long used such caravans as a way to build support and momentum. To build the new trade union movement—the guts of the PT—Lula’s caravan in the 1970s went from one new factory to another, defying the military dictatorship and building a consensus for worker power against the oligarchy. Lula, immensely popular amongst workers, faced ridicule from the oligarchy who suggested—falsely—that he admired Hitler and Khomeini. Such calumny did not stick. From 1992 to 1994, Lula’s Caravans sought to build consensus against the economic policies of Fernando Henrique Cardoso. It is this mass campaign that pushed Lula and the PT towards their first election victory in 2002. The current Caravan faced violence from the first. Opposition supporters have attacked the buses with rocks and eggs, and now with gunfire. Yesterday, shots were fired at the buses on the road in the state of Paraná in Brazil’s south. PT Senator Gleisi Hoffman said that the caravan was a “victim of an ambush.” She said that the violence has escalated in the past few weeks. The PT had asked for security but received none. “Are we going to let politics turn into a violent game with guns?” she asked. It is this confidence that scares the oligarchy and its foreign allies. 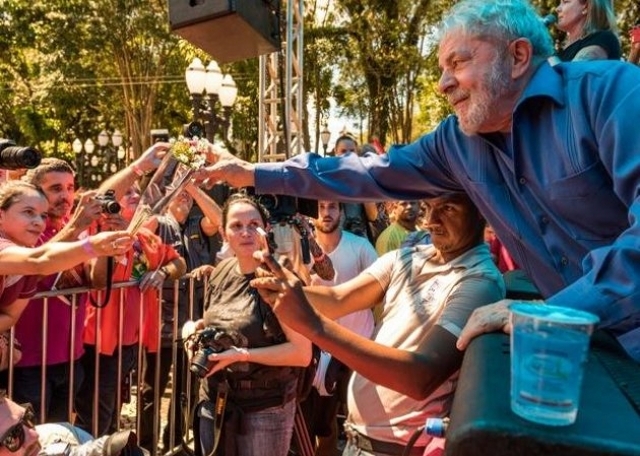 Lula’s reappearance has given strength to the poor to fight back against the cuts in public sector spending and against the rise of inequality. The oligarchy wants to send Lula to jail as a way to silence this upsurge. What has become apparent, however, is that even if Lula is arrested and prevented from being the PT’s candidate, this confidence will not be so easy to dampen. It will not be so easy to clear the streets. Other paths are open. Other futures beckon.